New for August 2008! This page came about from some email correspondence with Tim who lamented about the lack of a straightforward way of selecting isolation resistors in a multi-section Wilkinson. 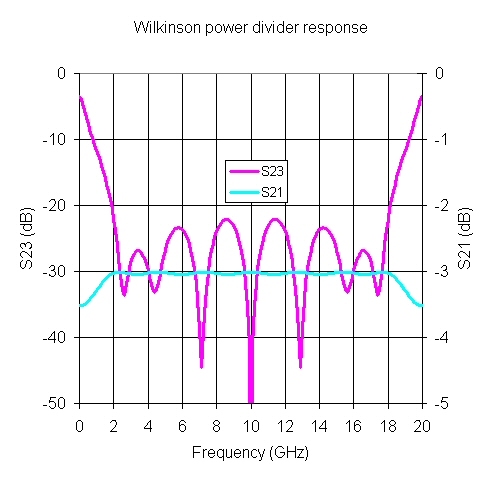 The selection of "optimum" resistor values for a design bandwidth beyond the N=2 Wilkinson is messy and almost always forces engineers to use an optimizer which is offered in expensive software such as Agilent's ADS, which not everyone has access to. 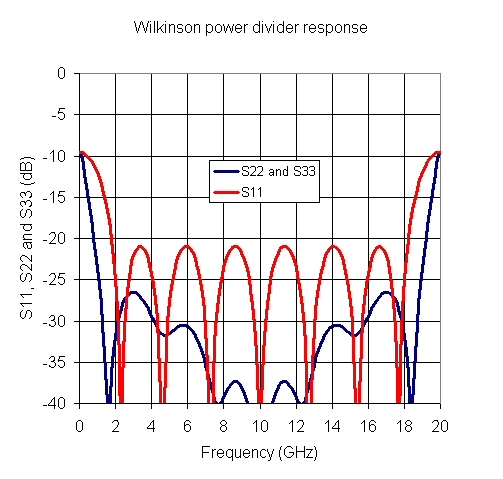 Using transformer analysis is an easy method to select line impedances of a multi-section Wilkinson splitter. We showed you how to do that here (look at Example 3). 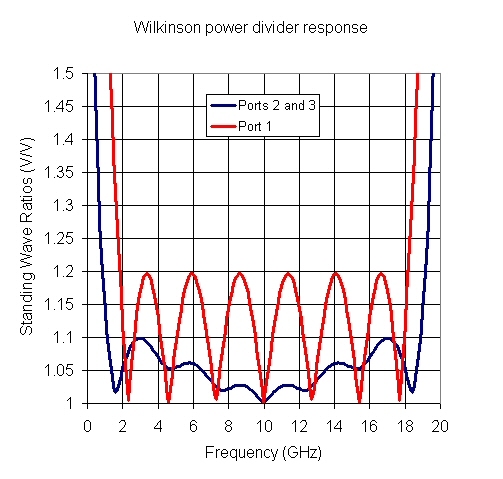 Now we have an Excel spreadsheet that analyzes the Wilkinson divider, including the isolation resistors, to give you the full three-port response. You can get a copy in our download area. We still haven't perfected the math, but our new spreadsheet will allow you to fiddle with the isolation resistors and watch their affects on isolation and reflection coefficients in (almost) real time. Some day the even/odd mode technique will be better explained on this page. The analysis below is also explained in Cohn's paper. The input (port 1) reflection coefficient is not a function of the resistors, it is merely a function of the line impedances (Z1, Z2, etc.). In other words, it behaves like a multi-section transformer, which can be solved in different ways. We chose to use Chebyshev in our spreadsheet, but it just as well could have been maximally flat. As Mr. Cohn pointed out, this model does not take into account the effects of the sections coupling to each other, which changes even and odd mode impedances and will throw off the response a bit. If you really need first pass success, use an EM simulator for the final design.